First flown on 26th September 1975 and delivered to the RAF on 22nd October 1976, XX956 spent most of her flying career in RAF Germany with 14, 17 and 31 Squadrons. She was retired to ground instructional duties at No.1 SoTT, RAF Halton in 1988 as 8950M, later moving to No.2 SoTT at RAF Cosford. 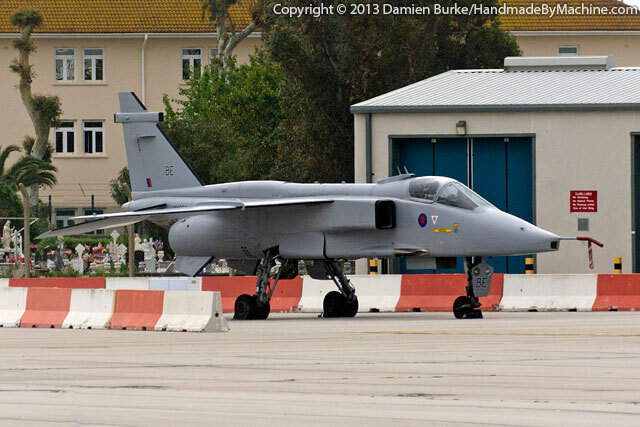 Jaguars were fairly regular visitors to Gibraltar, particularly when the Spanish needed to be reminded to wind their necks in a bit, so it is appropriate that XX956 is preserved there now, having been transported there in early 2009. She was prepared for display duties during 2009/10, ending up in this somewhat inappropriate and inaccurate all-over grey scheme (she finished her flying career in the green/grey wraparound scheme). She does retain her BE tail code from her previous paint scheme though.